2. Downloading and hosting files locally. Moving forward to the AngularJs development we need to setup the environment for AngularJs. 1. View on GitHub – these options will take us to GitHub, where we can see clear instruction on how to take checkout from there and setup the same at our end. Branch – this tells about the version as this is easy to understand from what is written there. 1.3. X is the stable version of AngularJs framework and 1.4.X is the latest one. 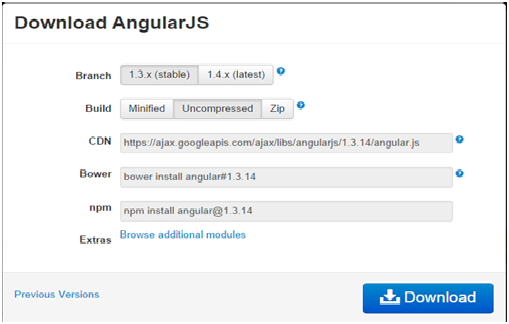 Build – this tells about in which format we can download the AngularJs library i.e. Minified, Uncompressed or Zip. CDN – CDN basically stands for Content Delivery Network which provides the facility to host your files (static files) on distributed servers rather thanhosting them on a single server. There are number of free CND are provided by different providers like Microsoft, Google etc. One benefit of using CDN here is, there will be no need to make extra call to server if you have already loaded AngularJs in your browser earlier. It will use the cached one. You can get more information on web about what is CDN and benefits of using CDN. ng-app : - The ngApp directive are used to define the root element and the auto-bootstrapping to an application. It's called auto initialization process. 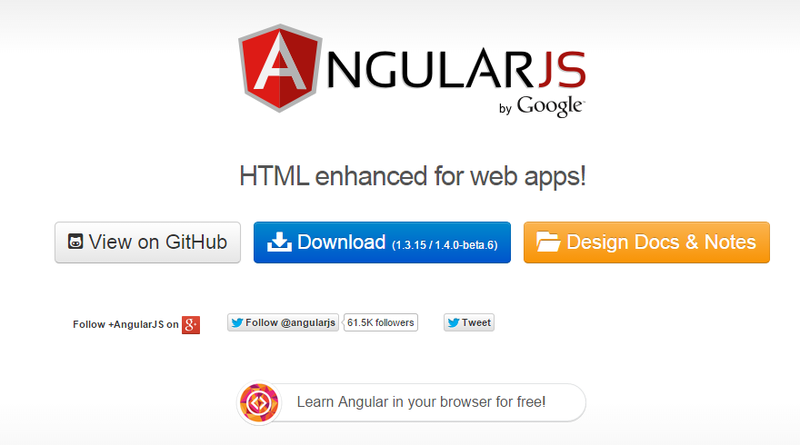 If you have multiple angular apps (more than one ng-app) that time you set manually bootstrap. ng-model :- The ngModel directive are used to bind the custom form control(input, select, textarea) to a property. i. Bind the views to the model. ng- controller :- The ngController directive are used to link the angular controller to the HTML Views. Let us go ahead with developing our fist app after setting up the AngularJs Environment. Now we have to attach controller to the view so that the data-binding can be controlled. We can do this by adding ng-controller attribute to the div where we want to add.